If you love gingerbread, this gluten free gingerbread linzer cookie recipe is one you won’t want to miss! 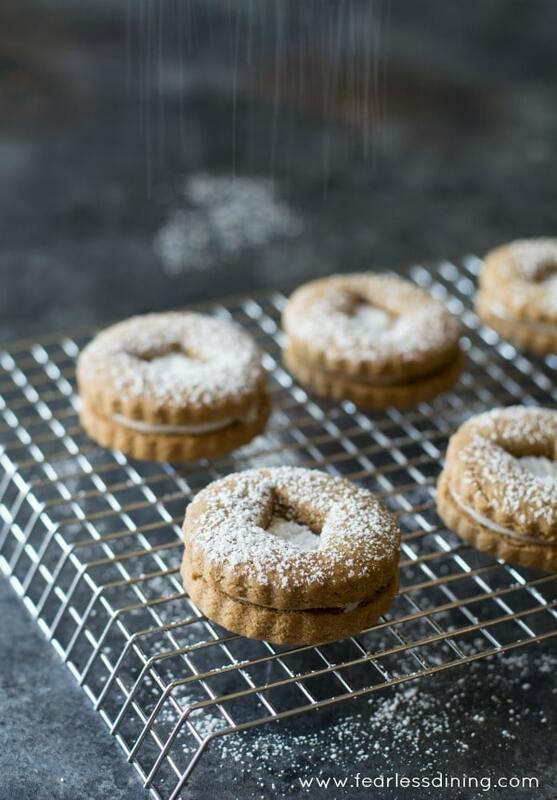 These deliciously good gluten free gingerbread linzer cookies also makes great cut out cookies so you can use your favorite holiday cookie cutters! The holiday season is coming so fast. Am I the only one who is still wondering where fall went? This year has just flown by! 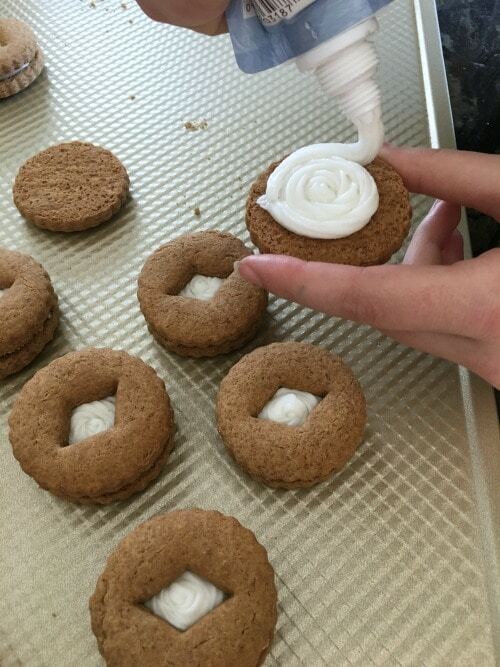 There is one special thing leading up to the holidays that I love…cookie making! 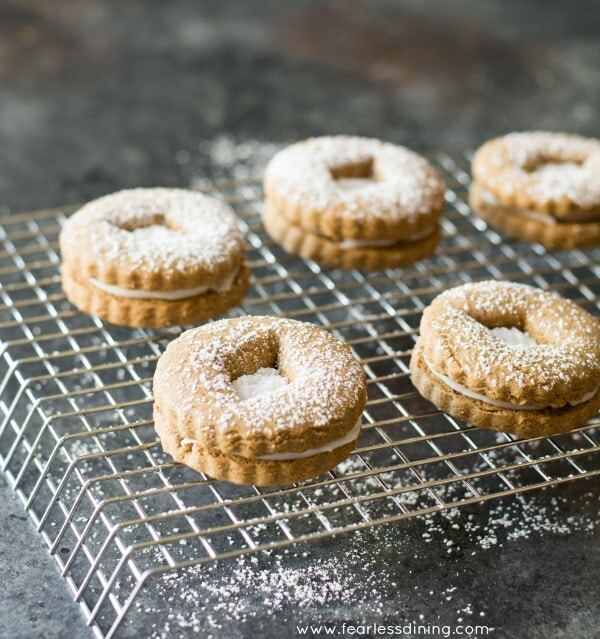 Have you tried linzer cookies? Linzer cookies have a pretty exciting history! Believe it or not, these cookies were originally a torte that originated in Linz, Austria. Linzer is said to be the oldest cake recipe there is. Over the years, the recipe was adapted into a “cookie-sized” version. If you love filled cookies, you will definitely want to try my other gluten free linzer cookie recipes like these Gluten Free Nutella Stuffed Linzer Cookies and these Grain Free Jam Filled Linzer Cookies. These gluten free gingerbread linzer cookies are a fun holiday cookie with a delicious hint of spice from the ginger. You can just barely see the powdered sugar falling on to these cookies! 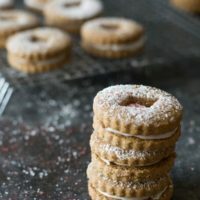 I decided to adapt my linzer cookie recipe even further by giving these cookies a fun gingerbread flavor for the holidays. These cookies are perfect for holiday gatherings, cookie exchange parties, and just eating for fun :-). Vanillin levels are easily measurable, therefore a great quality indicator for profiling fine vanillas. Gluten free flour blend. I used King Arthur’s gluten free blend, but this recipe also works very well with Bob’s Red Mill 1 to 1 Gluten Free Blend and Authentic Foods Multiblend. Add the dry ingredients to a large bowl. Use a whisk to blend all of the ingredients together. 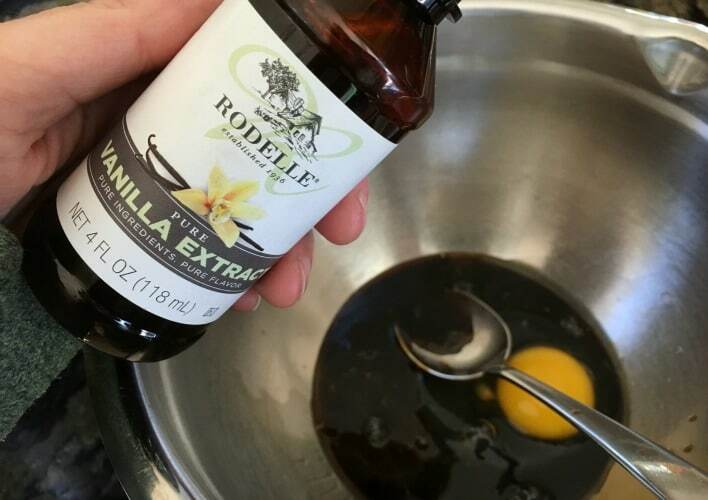 Add the Rodelle Vanilla to the wet ingredients. Mix the wet and dry ingredients together to make a semi-stiff dough. I chilled the dough for 1 hour so that the cookies will hold their shape when baking. Roll the dough between two pieces of wax paper to flatten. 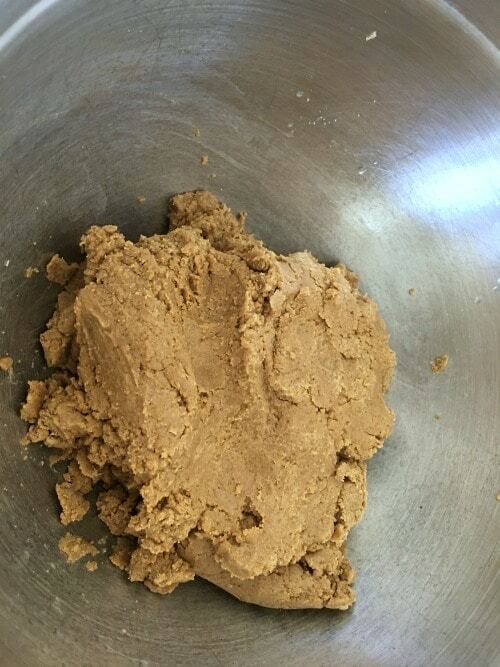 How thin do you roll out the gingerbread cookie dough? I rolled this gluten free gingerbread cookie dough to 1/4 inch thickness. You can do a little thinner if you prefer a thinner linzer cookie or gluten free cut-out cookie. 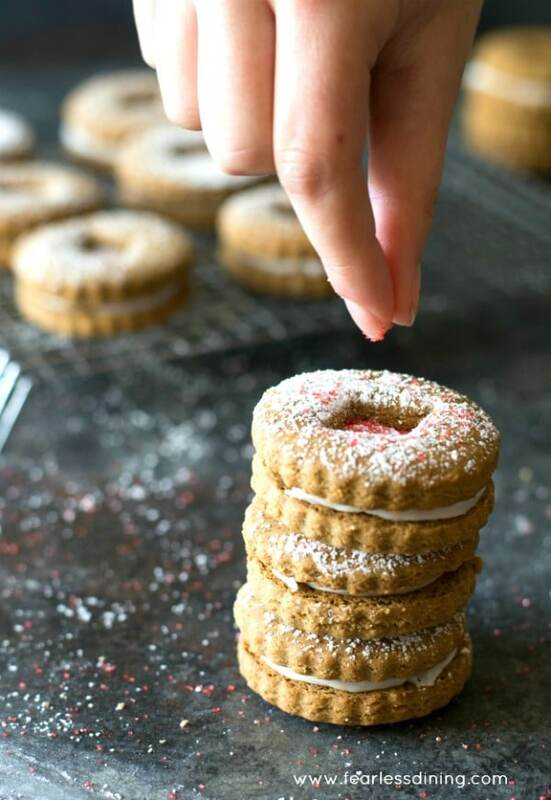 Use a linzer cookie cutter (or gingerbread man cookie cutter!) to make your tops and bottoms. Here is full disclosure…I hate the red linzer cookie cutters I have. The dough sticks to them and it is a pain to get the middle section out. I plan to buy these linzer cookie cutters soon. They have good reviews. If you have a linzer cookie cutter you like, please send me a note or add a comment and let me know which you use. What kind of filling can you use for linzer cookies? Nutella…because who doesn’t love chocolate and gingerbread combined? 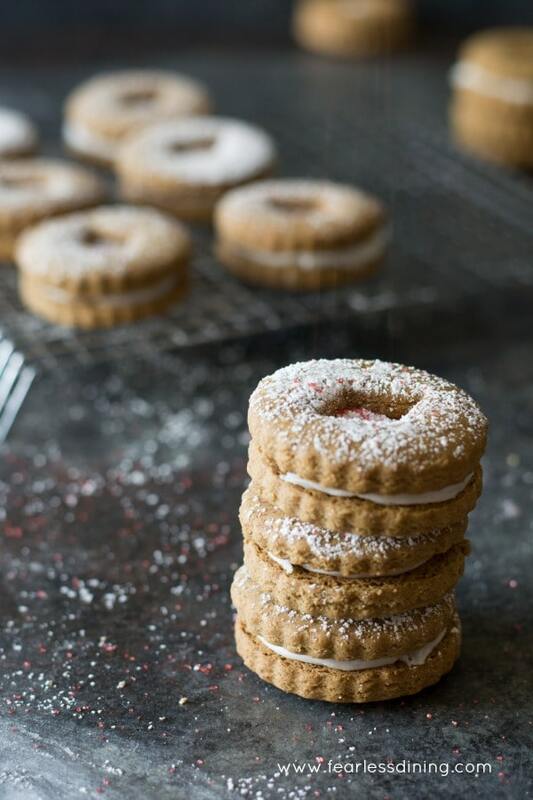 Optional: Dust your linzer cookies with powdered sugar and holiday colored sprinkles. 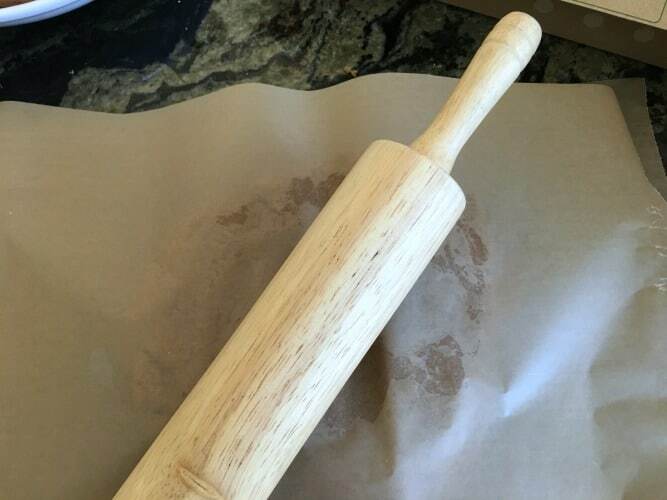 I am totally in love with this rolling pin…it is even dishwasher safe! If you choose to make this recipe refined sugar-free, use this coconut sugar instead of the brown sugar. 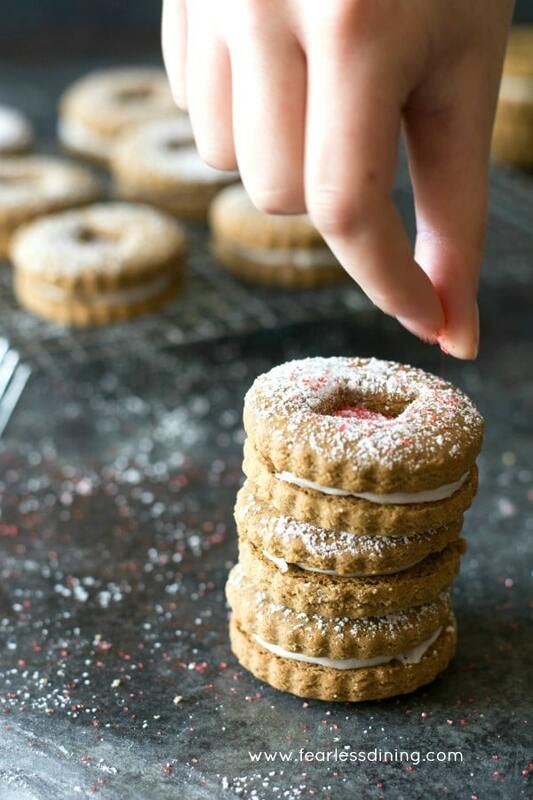 Easy gluten free gingerbread linzer cookies. frosting, Nutella, or another filling you like. Lay out a piece of wax paper and put the dough on top. Cover the dough with another piece of wax paper and use a rolling pin to flatten the dough. 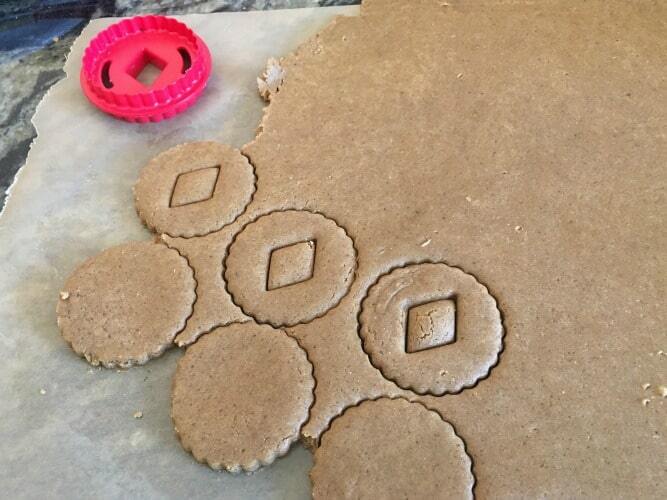 Use linzer cookie cutters to cut out the tops and bottoms of the cookie shapes. Place the cut out cookies onto parchment paper. Move the paper to a cookie sheet. Remove from the oven and transfer cookies to a cooling rack. Frost the bottoms of the cookies, place the cutout top cookie on top. Sprinkle with powdered sugar. These cookies look bakery perfect Sandi! I agree, a good quality vanilla is what really makes it with desserts like this. I need to try making these for my brother this holiday season! They look delicious! Very pretty cookies! And tasty sounding as well. A beautiful addition that a Christmas cookie tray. These look amazing! I’m going to try them for my Mom this Christmas she is gluten intolerant! 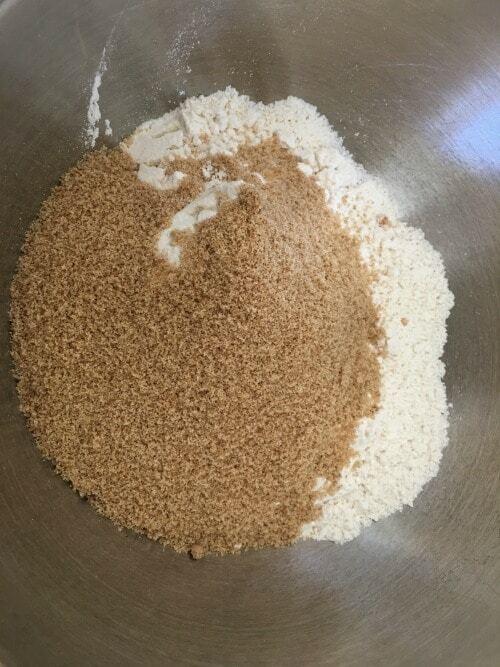 In the recipe it calls for 3/4 cups brown sugar twice, is this an error? Please explain. Hi Kim. Happy New Year. You are right, the brown sugar is there twice. I recently switched to a new digital recipe card and sometimes this happens. I am sorry I missed it when I was reviewing the transferred recipes. It is fixed now. Thank you. We just bought loads of these at the Christmas market, but I would love to try making them myself. Your recipe looks really simple too!